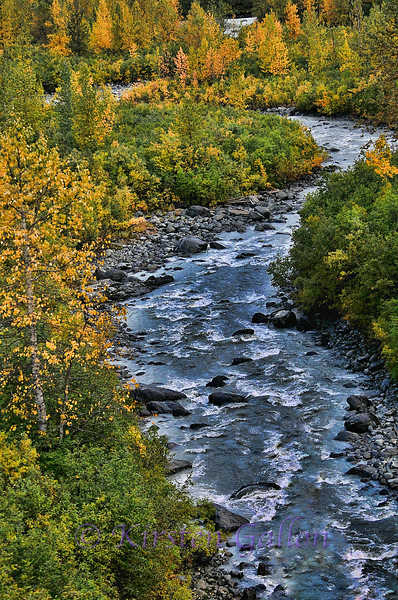 All of the photos contained in this gallery were taken while on the Coast Classic train ride from Anchorage to Seward. I was sitting in the Gold Star car that has the clear dome roof for viewing. There is a place in the rear of the car to stand and shoot without any window obstruction as it is open air. I pretty much spent the whole 4 hour ride in that area as I was afraid to sit down or I would miss a great photographic opportunity. They were coming at me faster than I knew what to do. I had to meter, compose and shoot constantly as the light and the angles were always changing. Needless to say I highly recommend this train ride. It was simply visual overload. There was just scene after scene after scene. It was very difficult and frustrating at times, but well worth it. Hopefully someday I can return and go to these places and photograph from the land and not on a moving train.